HEY APATHY! Drawing Comics Retrospective Exhibition 2001-2006. Collecting a number of large format ink on paper artworks the Cambridge Gallery featured a broad selection of works from previous “HEY APATHY!” exhibitions. The show included works from “HEY APATHY! and the Apocalypse” 2001-02, HARD RAIN 2003, The CITY 2004, as well as one new street painting and a video installation. 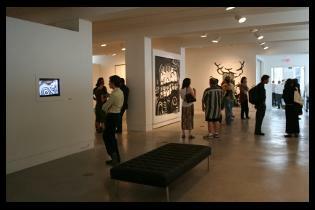 The video installation was presented on a wall mounted LCD screen showcasing animations and time-lapse artworks 2001-2005. This reel featured a number of short hand drawn stop-motion films including a 2 minute long metropolitan fable entitled “Of Civilized Discontent”, a detailed animated painting about war called “HARD RAIN”, and several post-existential vignettes depicting habits as horrors. As well as the animations the installation also showed various time lapsed video documentations of street, studio and live drawing performance artworks. From the faceless apocalyptic crowds of the first series (2001) to the cartoon cities made in front of audiences in downtown Toronto (2005), the show offered an extensive description of the progressive nature behind the work. The collective exhibition exemplified the technical and thematic evolution of the “HEY APATHY!” project, revealing an extended narrative expression developed over a 5 year period. The work was loaned from private collectors and the entire show, including a prestigious publication with articles by curator Sascha Hastings, was sponsored by the Canada Council for the Arts & the Ontario Arts Council.